> What happens to honeybees in the winter? What happens to honeybees in the winter? We are asked this so many times. 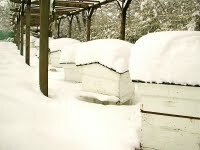 Our customers are concerned honeybees will notsurvive the cold with snow covered hives. Firstly bees no not hibernate, they stay awake throughout the winter months and venture out of their hives on warmer days. 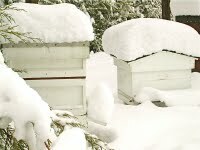 In fact snow and low temperatures are good for honeybees. They will huddle together to stay warm and are completely inactive during these times-but awake!. That’s good because they do not consume much if any of their food stores. The biggest problem over the next few months will be ample food stores and starvation. If the temperature rises above 13 Celsius bees will fly out of their hives in search of food. They eat their stored honey to create the energy needed for the trip. At this time of year no British plants are proving pollen or nectar so this is a fruitless exercise for the bees that wastes their food stores. One hazard is snow covered entrances. If the entrance is blocked a build up of carbon dioxide will occur within the hive and could suffocate your bees. So we must travel around to our different apiary sites and inspect the hives, clearing away the snow from the entrance, check roofs have not blown off, mice have not gained access as they will eat the bees, vandals have not caused damage which is a problem in remote sites etc. So our work does not stop after the honey harvest! Now is the time we also make preparations for the new year. Hives need to be repaired and painted. Hundreds of frames need to be nailed together and foundation fixed. CLEANING! We never seem to arrive. Cleaning is done throughout the year and never stops. Sterilising the wood boxes, melting and refining the beeswax. Apiary sites are cleared and cleaned, fences mended. Landscape work begins on our orchard. New trees that have been grafted and nurtured over the past two years are now planted out. 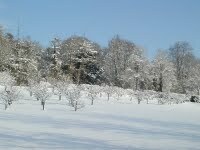 This is a dormant time for the apple trees and transplanting at this time of year causes the least amount of stress to the tree. So all in all we still have a lot of work ahead!